← AUTHENTIC PIZZA NAPOLETANA ARRIVES IN MIDTOWN MANHATTAN AT PizzArte NYC!!! BEEHIVES AND BEEKEEPING AT THE WALDORF=ASTORIA!! 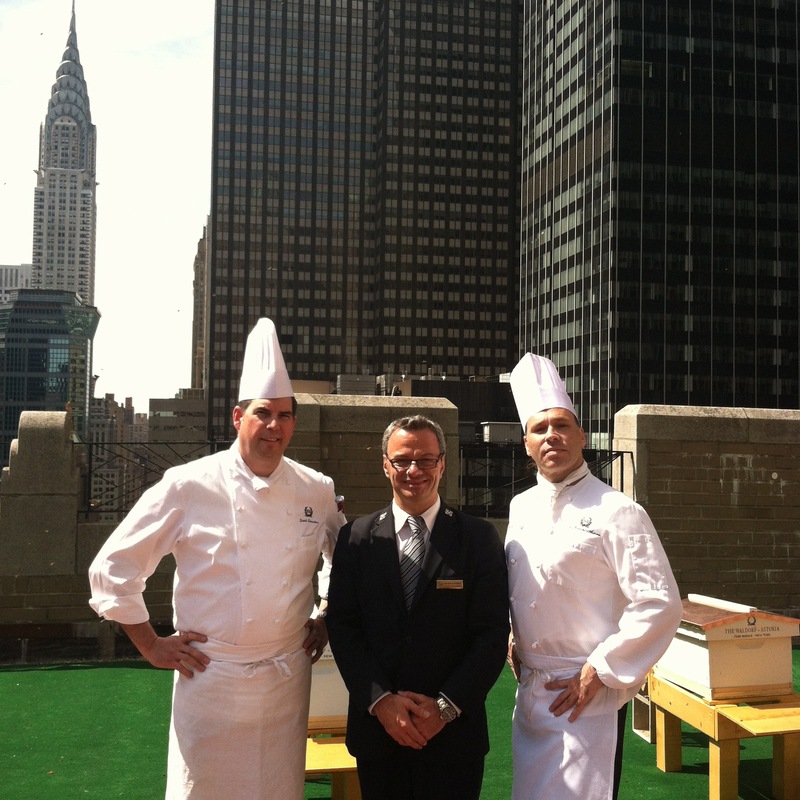 Waldorf=Astoria Chef David Garcelon, Michael Romei Chef Concierge, and Chef Joshua Bierman examine the new bees and beehives from the 20th floor terrace with a spectacular view of The Chrysler Building in the background!! This very special newly opened terrace of The Waldorf=Astoria is being used to house more than 45,000 bees in six beehives as a green initiative; the bees will make honey which will be harvested and used in the various food outlets. Once the program becomes established and the bees become settled in their new home: Guests will eventually be allowed access to see the beehives but will always be escorted by a member of the bee team. This very exciting and most remarkable program is being organized by three Chefs of the Waldorf’s culinary team: David Garcelon, Peter Betz, and Joshua Bierman. 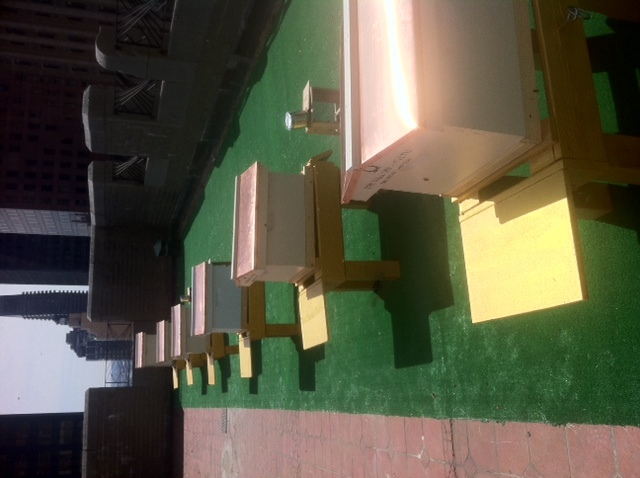 Shown above are the six custom-made Waldorf-Astoria beehives; again located on the 20th floor terrace with a spectacular panorama view of midtown Manhattan!! This entry was posted in Hotel, New York and tagged Beehives, Beekeeping, David Garcelon, Joshua Bierman, Michael Romei, New York Hotels, Peter Betz, Waldorf=Astoria, Waldorf=Astoria Beekeeping, Waldorf=Astoria Bees, Waldorf=Astoria Chefs. Bookmark the permalink. 2 Responses to BEEHIVES AND BEEKEEPING AT THE WALDORF=ASTORIA!! HOW EXCITING AND BRILLANT, MICHAEL.. HAVE A WONDERFUL EVENING AND A LOVELY DAY OFF TOMORROW.